Firestone PondGard™ ed EPDM GeoGard™ are rubber panels with high performances, the benefits are recognized by installers, professional landscapers and architects worldwide. The installation of these products is easy, considering that the material is lightweight, easy to position and available in a variety of measures without joint (widths up to 15.25 m and lengths up to 61 m). 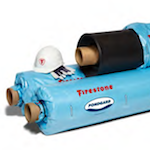 For the construction of large water bassins, more than one Firestone PondGard™ panels can be installed on site joining them with the self vulcanizing double-sided adhesive Firestone Quick Seam ™ Tape. Are not required special tools or specialized personnel. These liners are highly flexible at low temperatures (down to -45 ° C), allowing installation in any time of the year. Adapting perfectly to the different conformations of the banks, Firestone PondGard ™ liner allows great creativity and allows you to make even the most demanding installations. The liner has an excellent elongation capability that allows it to adapt to the performance of the laying surfaces. This feature is important when of the pond is filled up, when the possible subsidence of the land, the hydraulic load or erosions could cause tensions of the membrane. The Firestone EPDM rubber has been specially designed to be safe for the life of fish and aquatic plants. This guarantee is confirmed by a special marking on the membrane that certifies its non-toxicity. Being a highly stable membrane, Firestone PondGard ™ liner resists to algae and microorganisms that are part of a healthy ecosystem of natural pond. Moreover, the Firestone Building Products facilities have received an ISO 14001 certification for their environmental management system. The Firestone EPDM rubber provides exceptional resistance to UV light, ozone, frost, snow, and extreme temperatures. Our liner does not contain plasticizers that migrating could cause cracks or breaks and thus has extraordinary durability: even after over two decades of service, the forms of water built with Firestone PondGard ™ liners are functional and beautiful as the first day of installation. The Firestone EPDM liner is developed by Firestone, a leader in the rubber industry. Since the beginning of 1900, Firestone has served its customers with rubber products designed for optimal performance and long life. This tradition of quality has extended to the market of the pond through the Firestone Building Products, a leading global manufacturer of waterproofing rubber membranes. We advise you to pay close attention to who sells liners for ponds with super promotions, because the liners too cheap are suspicious and often not suitable for applications related to the lakes. Also avoid buying EPDM liners for roofs, as they are often toxic (sometimes very toxic) to plants and aquatic animals. The Firestone EPDM rubber membrane, once installed, requires a minimal or null maintenance and remain functional for long time. 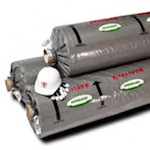 In case of damage, the Firestone EPDM liner is easy to be fixed in place. Making a pond in your garden will undoubtedly have a beneficial effect on the quality of your life: watching fish and frogs, touching the surface of the water, smelling the scent of water lilies in bloom, relaxing thanks to the sound of the gurgling of water, and enjoying your natural pool with family and friends. The pleasure of a water garden will improve your habitat and will increase the value of your home! Ex. 6 m long pond 4 m wide and 1.5 m deep. Make the excavation with the desired shape and with sloped edges inward. Dig deeper areas (about 80 cm to 100 cm for small ponds and lakes deepest) and shallow areas (about 25 cm) for plants. Eliminate each stone or root and spread a layer of sand on the bottom of the pond. It is strongly recommended to pose a substrate of nonwoven geotextile as anti-puncturing for the membrane. Spread into place the Firestone PondGard ™ membrane, unrolling it carefully into the pond without drag to avoid damages against pointed or sharp objects. Hold in place the membrane stabilizing the edges, only in some places, with brick or stone with flat surface. Gradually enter the water into the pond, bending and placing the membrane in order to give a neat appearance. 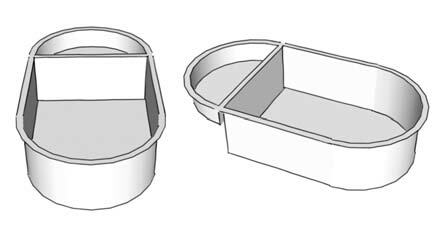 With the increase of the water level, the membrane initially will stretch and then slide inwards, adapting to the shape of the excavation (if the ballast at the edges was too heavy, so as to prevent the sliding of the membrane, this must be lightened). Cut with scissors the excess material, leaving around the perimeter of the pond a border of the membrane sufficient for its anchoring to the ground. The membrane can be concealed, and at the same time anchored to the edges well leveled with the same heavy elements provided for finishing (rounded stones, bricks, etc.). The black color of the EPDM Firestone liners depends from one of the components of the mixture optimized by Firestone for the realization of its products. 5. the dark color turns out neutral during colonization by aquatic microorganisms ensuring an aesthetic effect always pleasant (the liner after a few months of installation assumes natural colors ranging from green to blue to gray). N° EN13361:2004 - Construction of water reservoirs and dams. N° EN13362:2005 - Construction of canals. N° EN13492:2004 - Construction of liquid waste disposal sites, transfer stations or secondary containment. N° EN13493:2005 - Construction of solid waste storage and disposal sites. It is possible to order 1 o 1,20 mm thick EPDM panels custom-made up to 2000 m2 in one piece. It is possible to order 1 o 1,20 mm thick EPDM panels custom-made in one piece in 3D. In this way, when there are formal and well-defined walls, it is possible to have a piece of membrane specially prepared so as to speed up the processing and installation on site.